Goldberg’s Deli has been an Atlanta institution since 1972, which is, coincidentally, the year I moved to Atlanta. Every Sunday, my dad would go to Goldberg’s for nova and bagels for lunch. 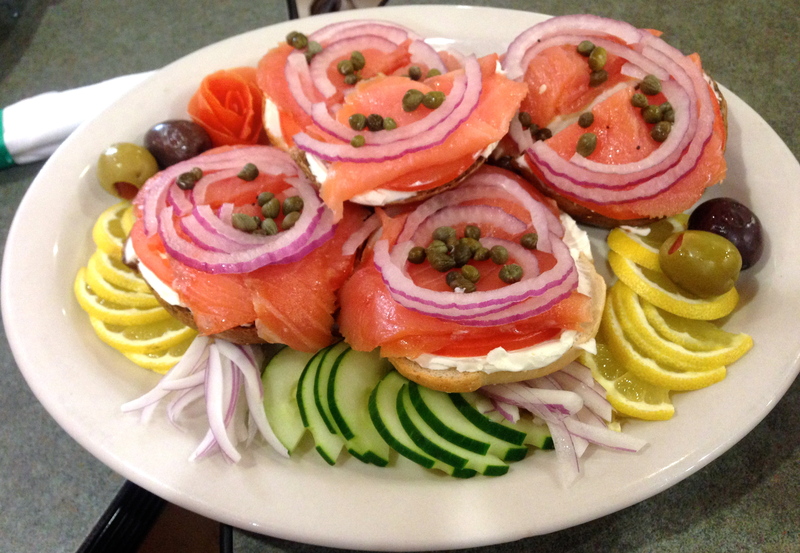 Over forty years later, we still go to Goldberg’s (albeit the East Cobb location) whenever we need a dozen bagels. When we were offered a chance to attend a menu tasting at Goldberg’s, we jumped faster than you can spread chopped liver on toast. 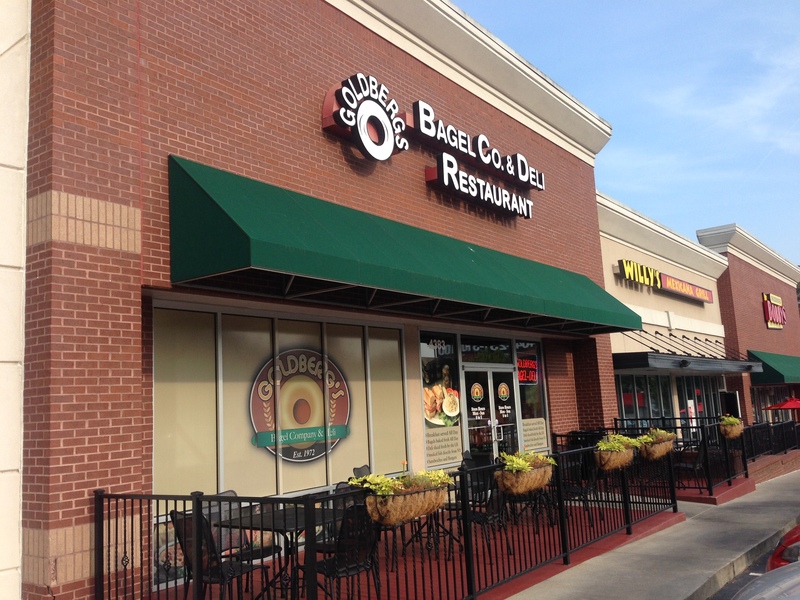 This is the first location of Goldberg’s, located on Roswell Road near Wieuca. Coincidentally, they are now next to the original Willy’s and the first Cheeseburger Bobby’s that’s located inside the perimeter. The decor pays homage to New York. Owner Howard Aaron, who is here tonight, says that the best delis are in New York, so why not try to replicate that in Atlanta. As you will see, he’s done a remarkable job. Later, he will take us to the kitchen where we will make bagels. We are present tonight because of the kind invitation of Malika Bowling, who writes the excellent Atlanta Restaurant Blog and is the kingpin of the Association of Food Bloggers. 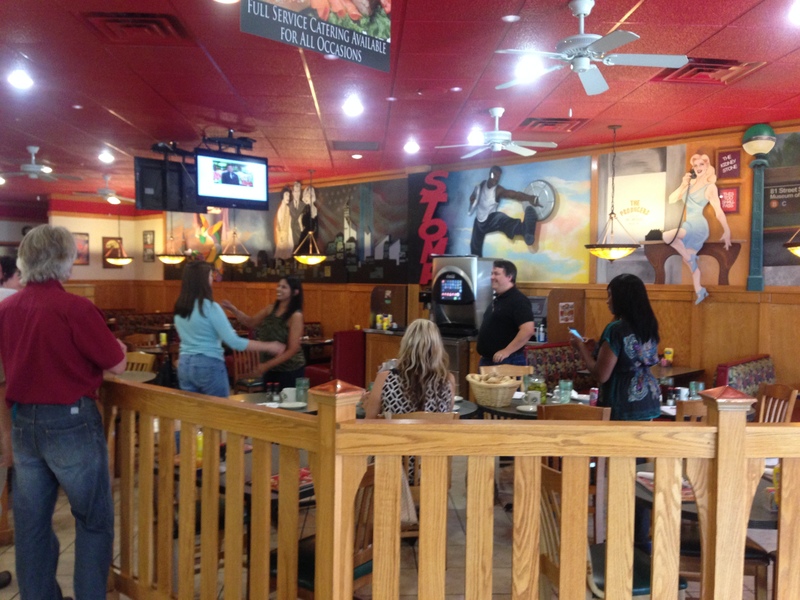 We’ve got bloggers from around the city, including Grant and Marie of Marie Let’s Eat, Victoria Dunmire, Mrs. Erica Smith, Iron Stef, and Davinci from Your Life After 25. Let’s get right to the food, which almost tells the story just by looking at our Date Night food cam. Kudos to our chef for excellent food presentation this evening. The mushroom barley is in a beef stock. 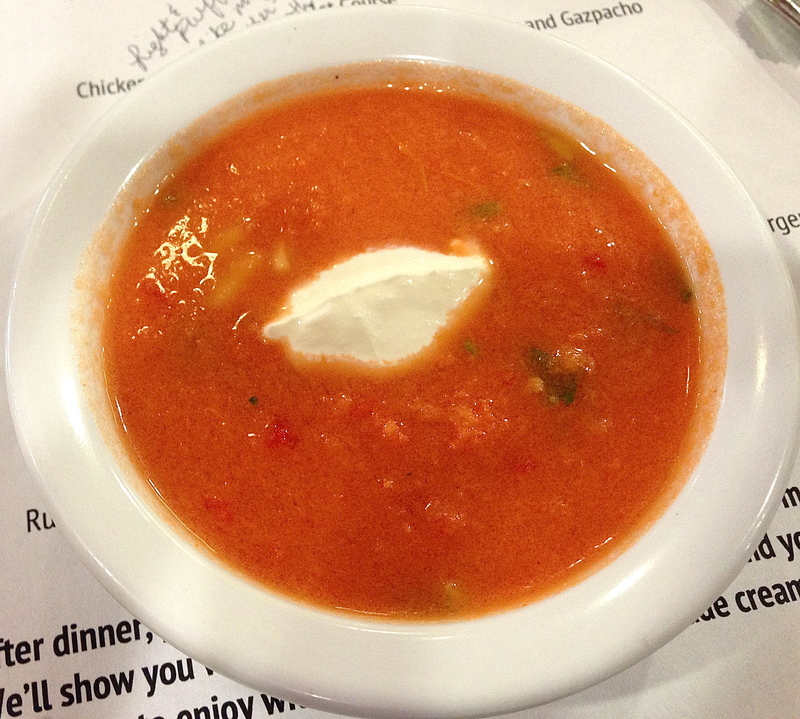 The gazpacho is a pleasant summer surprise. It’s served cold and tastes like salsa in a bowl. 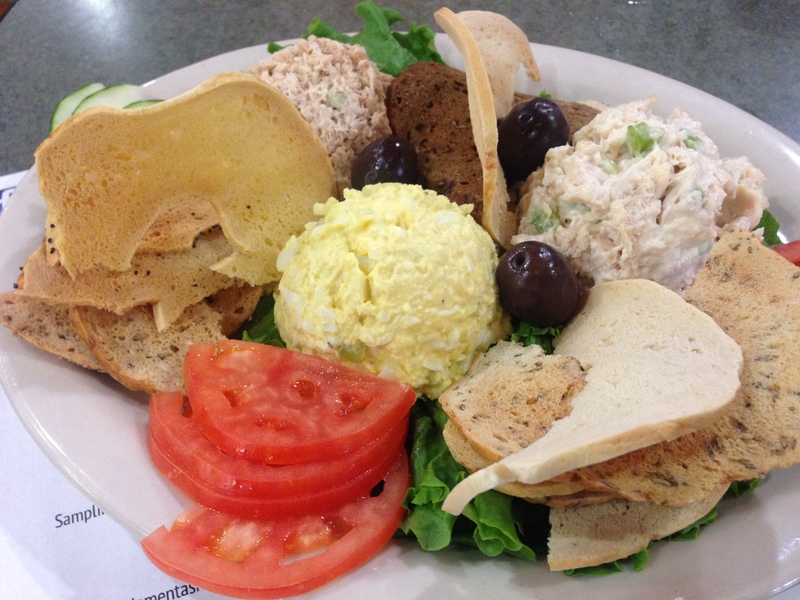 Here’s an assortment of their salads, served with fresh, crunchy bagel chips. Egg salad, tuna salad and chicken salad are fresh and creamy. And best of all, there are no onions. You want chopped liver with that? Here’s another secret–schmaltz. 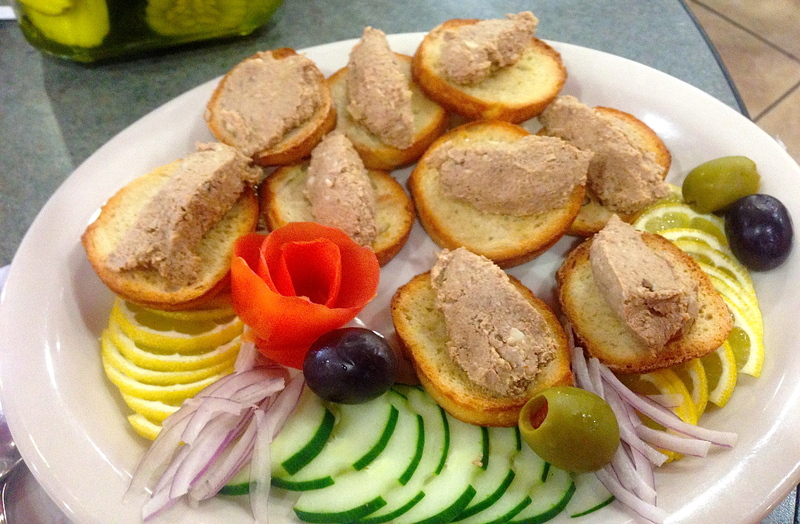 Chicken fat is the key ingredient to chopped liver and we can report that you taste it in every bite of this decadence. 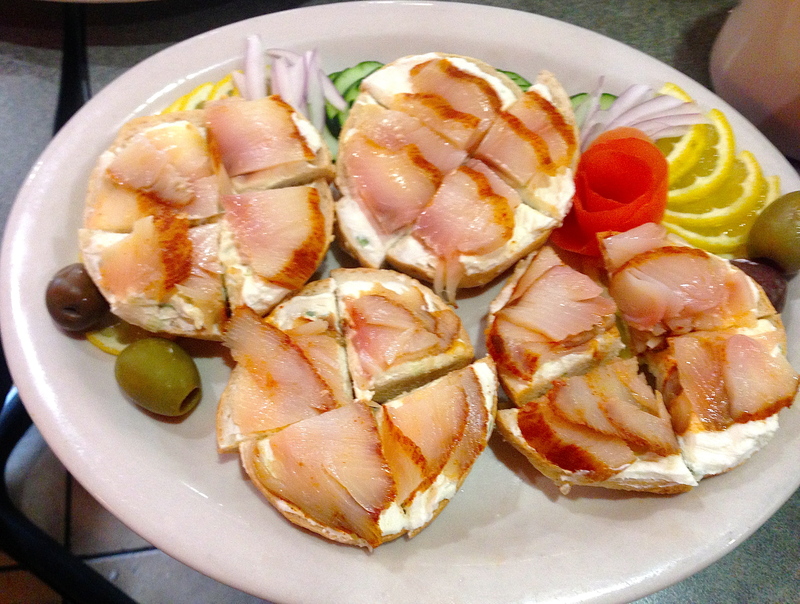 There’s nothing better than nova salmon and cream cheese on a fresh bagel. 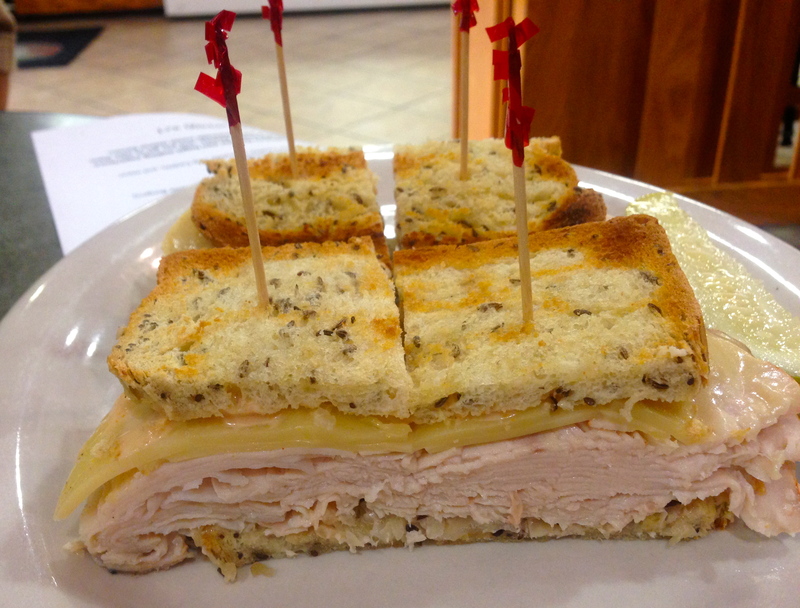 It’s simple, it’s delicious, and nothing says “deli” like this dish. Aaron flies his smoked fish in from New York and we are glad that he does. Ever had sable on a bagel? As you can see from the picture, it’s a fatty fish, but fish oil is good for you, so eat up. 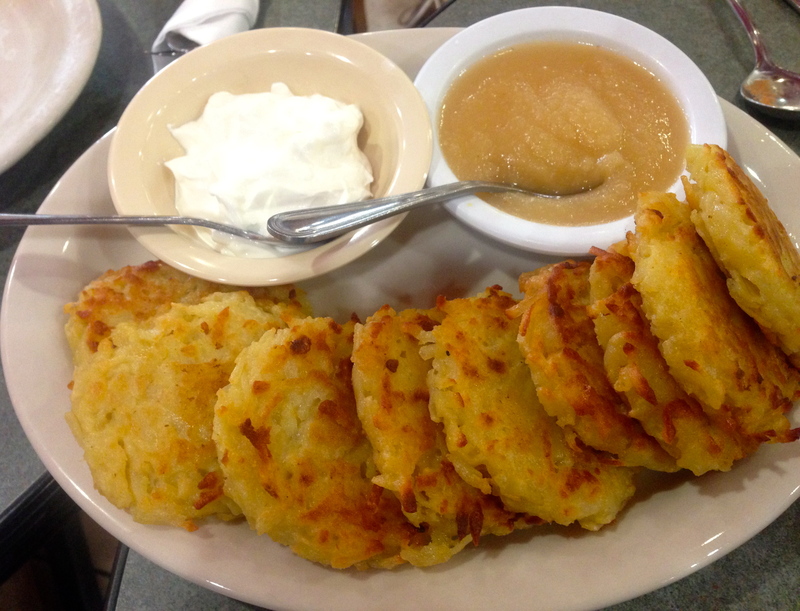 Potato latkes come with sour cream and applesauce. Creamier than the latkes Eve makes once a year, they are like eating the center of a knish. 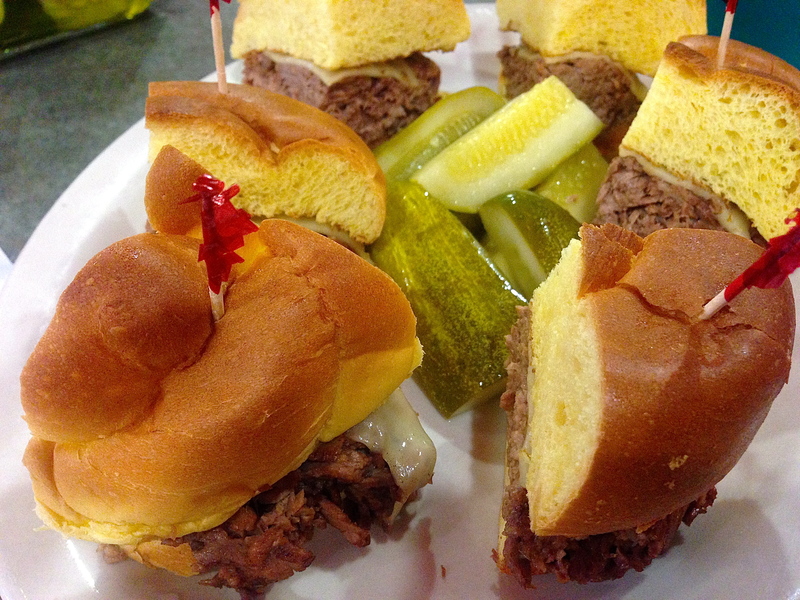 The brisket sliders on house-made challah are really moist. We don’t know how they get the meat this moist, but if you are a brisket lover, these are for you. 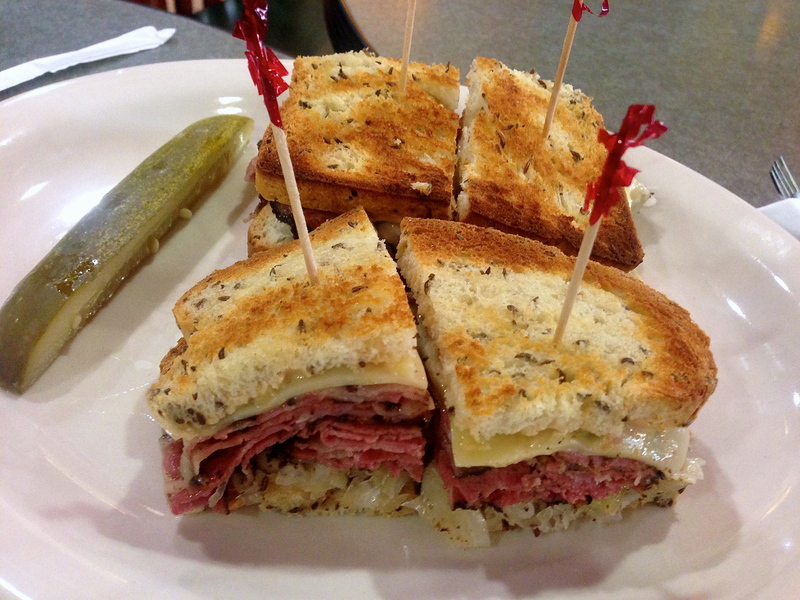 Goldberg’s has three kinds of Reubens. The California (seen here) has pastrami and the Brooklyn has corned beef. The Georgia has turkey. 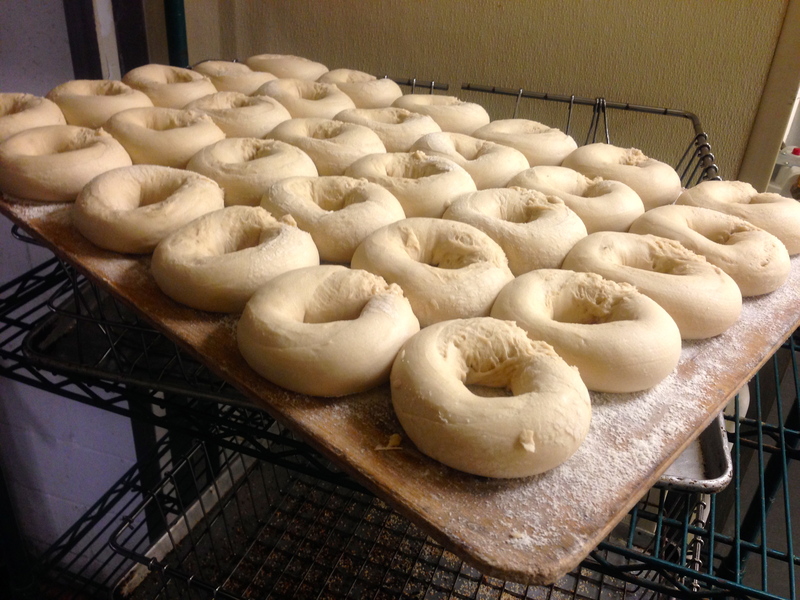 All come on rye bread that’s made right here. 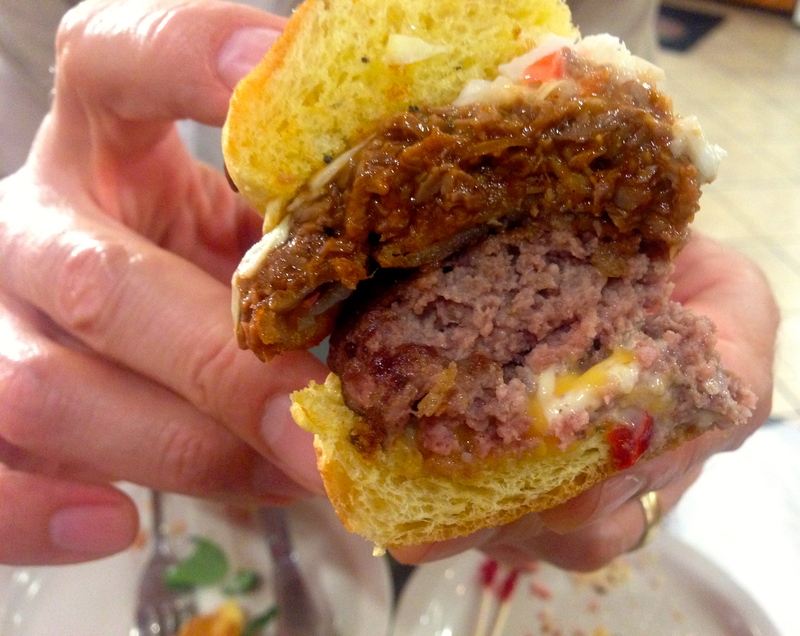 Burgers are a recent addition to the Goldberg’s menu. 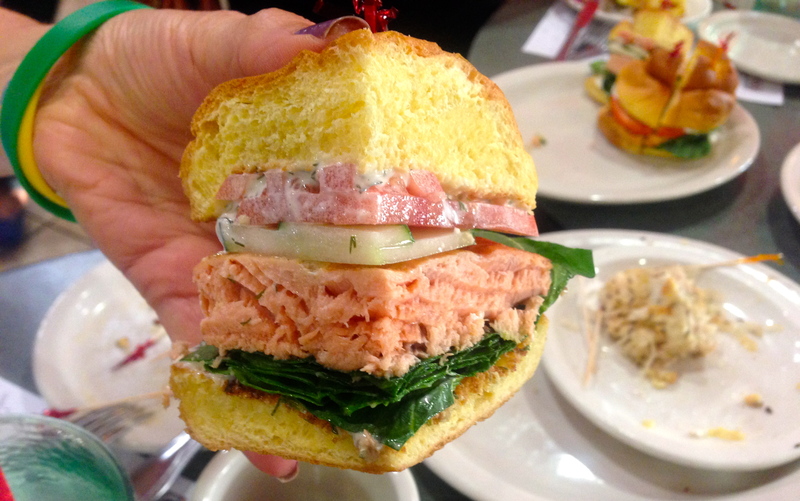 The salmon burger is a whole piece of salmon, not a chopped up salmon patty. It comes with a nice dill sauce on that great challah bun. I really like the southern burger, which has brisket, pimiento cheese, cole slaw and barbecue sauce along with the burger under the bun. The chicken and waffle burger is just so-so. 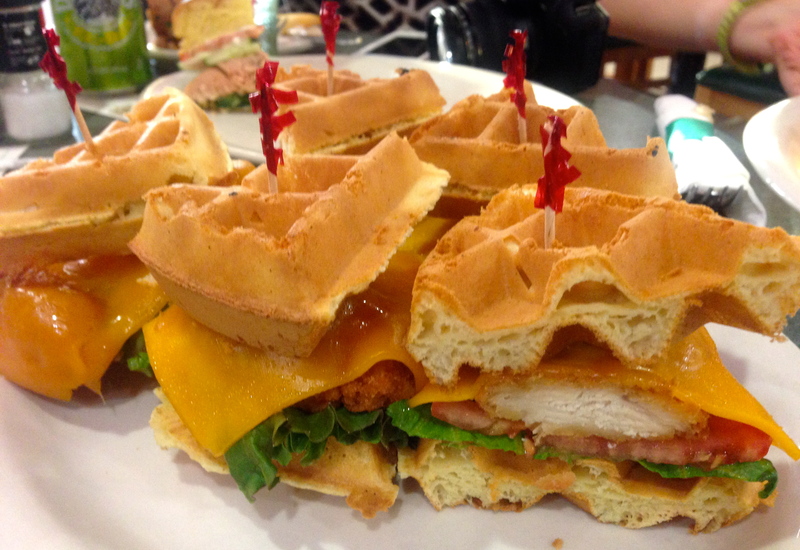 The crispy waffle has cheese, lettuce and tomato with the chicken. We would like it better if they ditch the cheese and veggies and just drown the whole thing in maple syrup. Need a quick, easy dinner? Goldberg’s has casseroles to go. 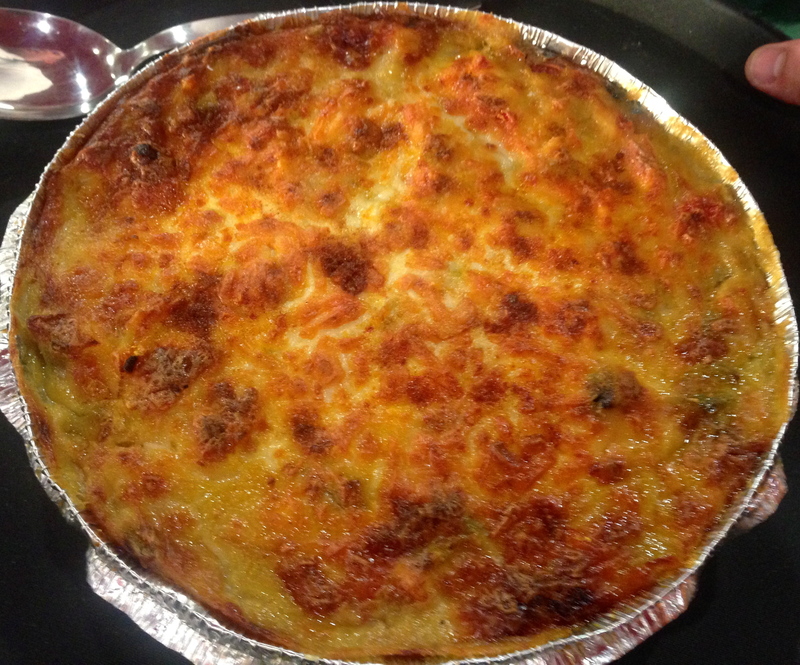 This is the chicken tetrazzini. They are even nice enough to let us pick a casserole and take it home. We have their best-seller, the chicken pot pie, in the freezer for a future dinner. Speaking of dinner, it looks like Goldberg’s will be open for dinner soon and you will be able to get beer and wine at many of their locations. And there’s going to be a new location in Alpharetta. After all of this heavy deli food, we need something sweet. 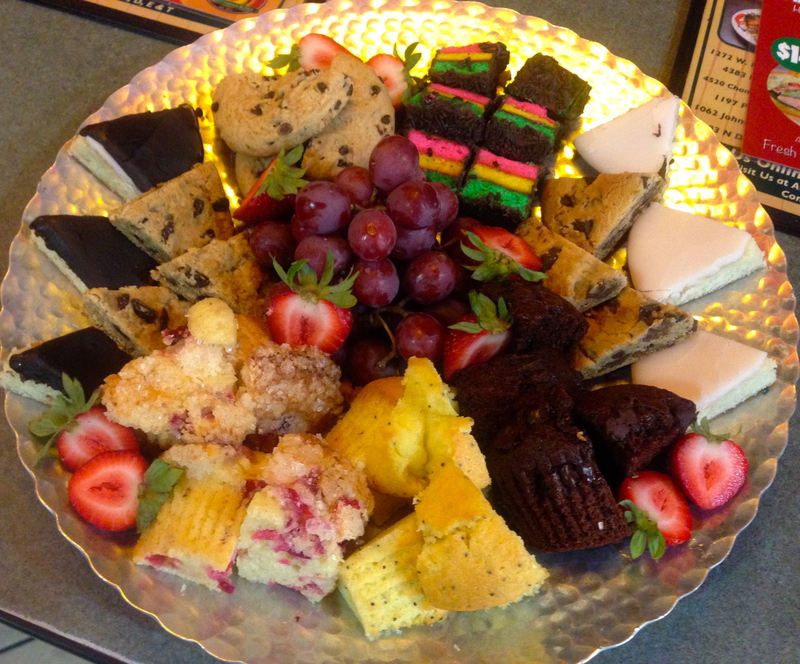 Check out this platter. 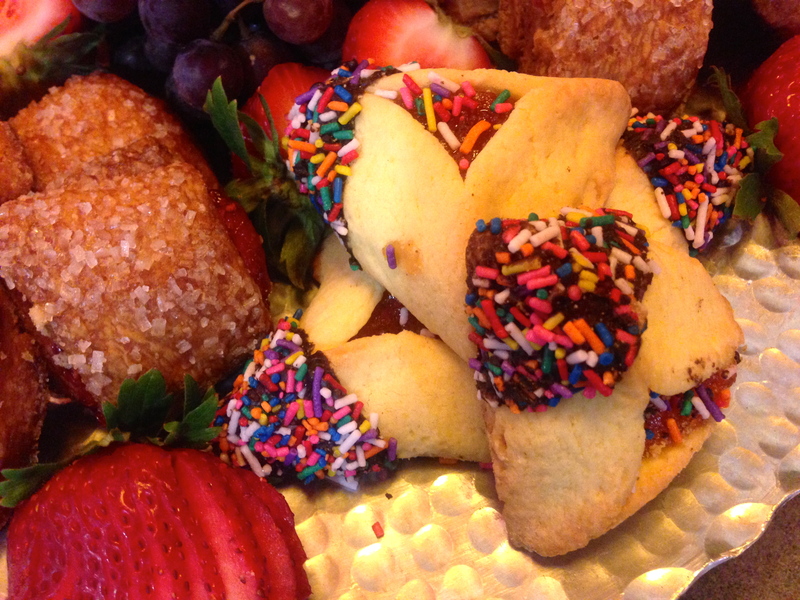 Evidently, hamentashen is not just for Purim any more. It’s even better dipped in chocolate with the sprinkles. 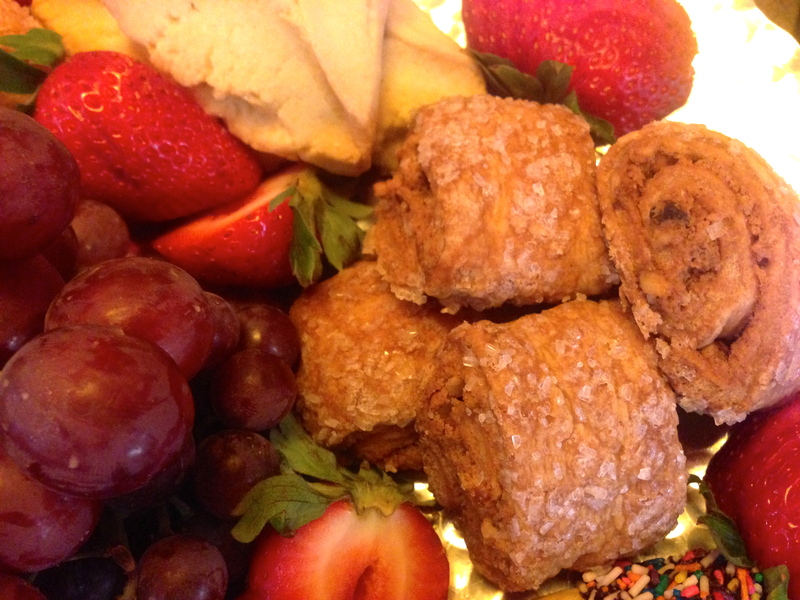 And we can never get enough rugelach. It’s one of our favorite cookies. 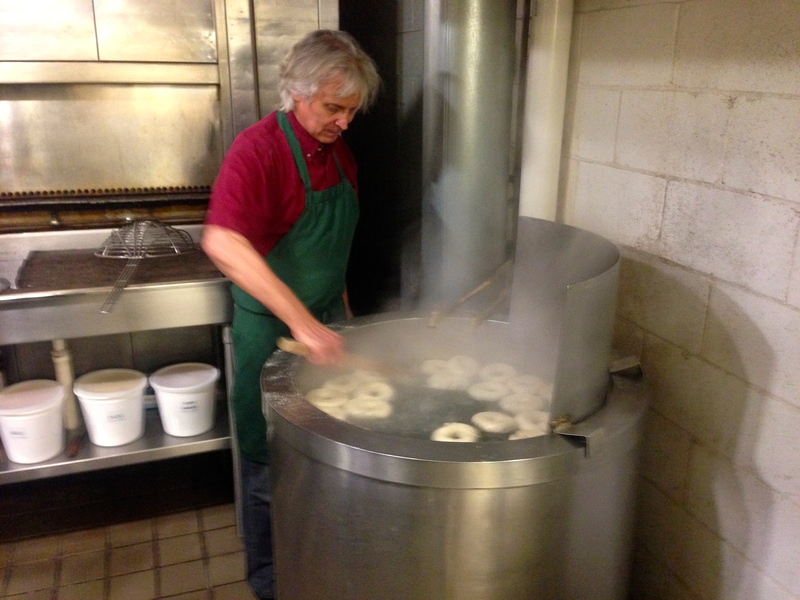 After the meal, we go back to the kitchen to see how bagels are made. They make 54,000 of them here each week. 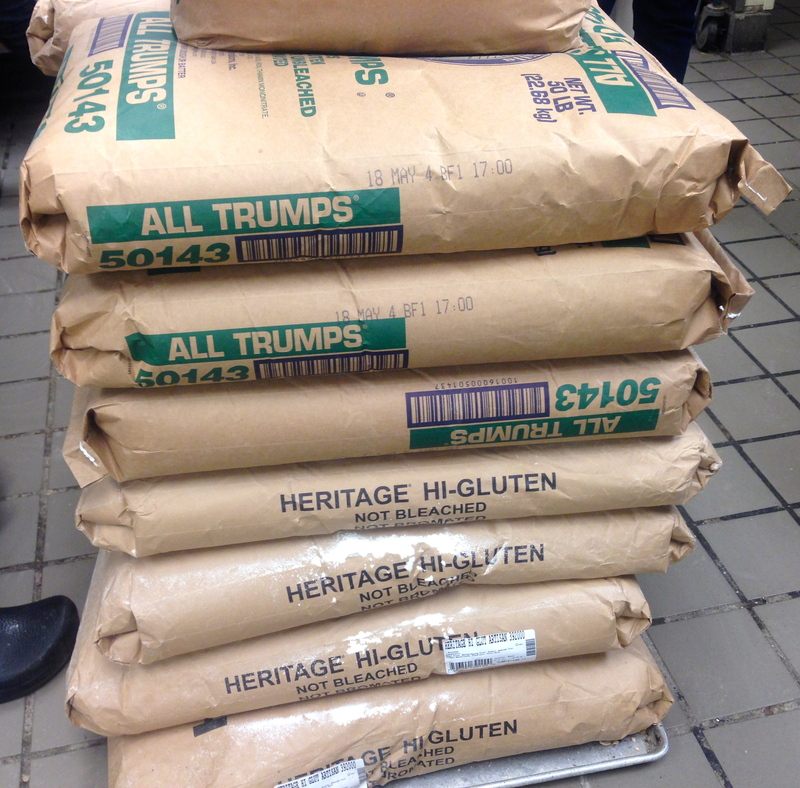 That’s 4-5 tons of hight-gluten flour in case you are keeping track. None of that gluten-free cooking here! They have to boil every single one of them. The owner of the chain shows us how it’s done. This is a labor-intensive process. That’s why they cost so much. 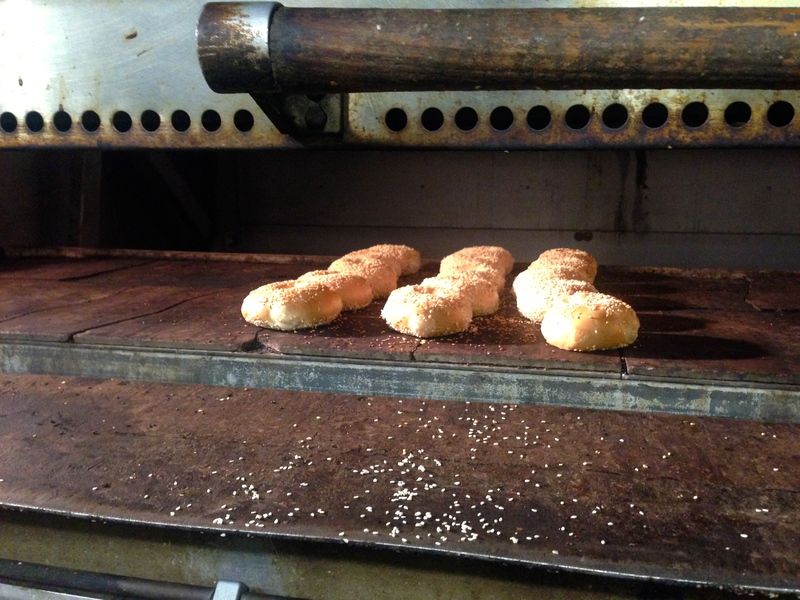 Roll them in the topping you want and put them in the oven. It’s really hot in this part of the restaurant, which is great in the winter, but we are all working up a sweat while we watch. About ten minutes later, viola! 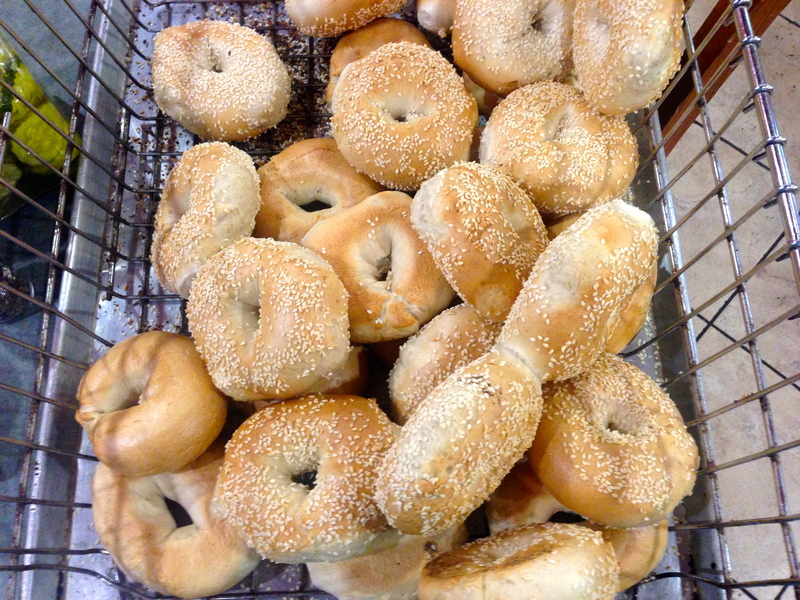 Hot, yummy bagels, that we are too full to eat! They don’t make them this way at that chain named after a brilliant physicist. We take some home for later and enjoy them the next day. 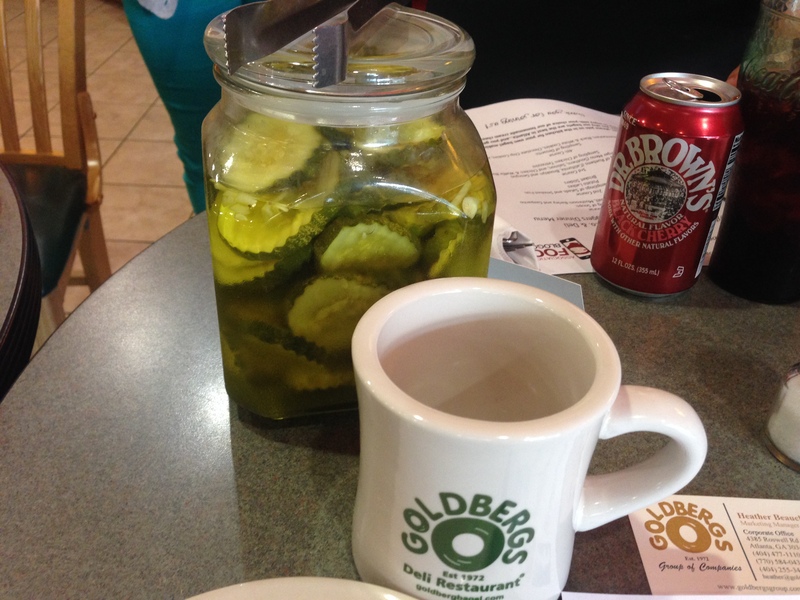 Disclosure time: The food at Goldberg’s was complimentary and we did not pay for our meal. Our opinions and prolific prose, however, are priceless. Thanks to Malika for organizing this event and a special thanks to Heather Beauchamp the Marketing Manager for Goldberg’s for hosting us. 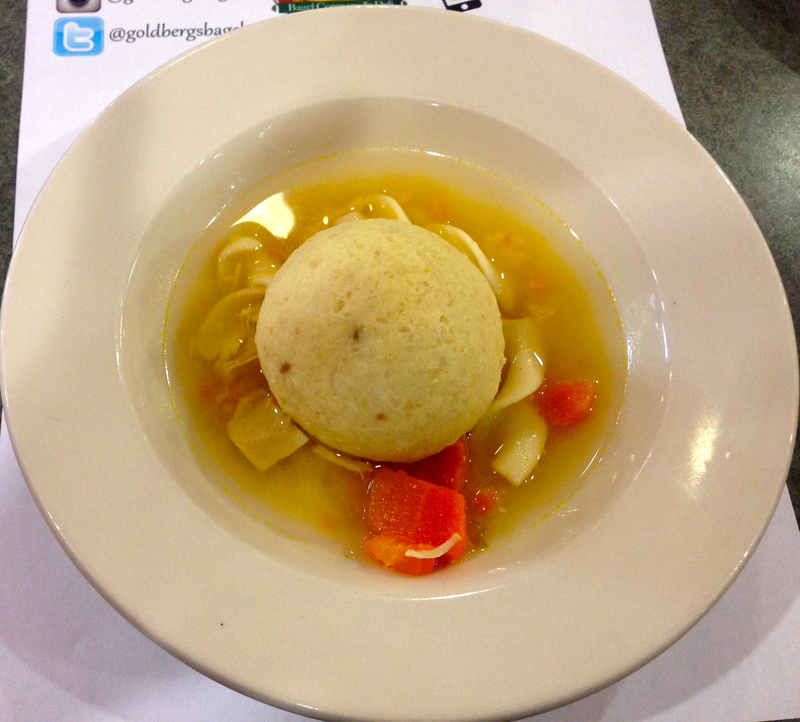 I LOVE Goldberg’s! 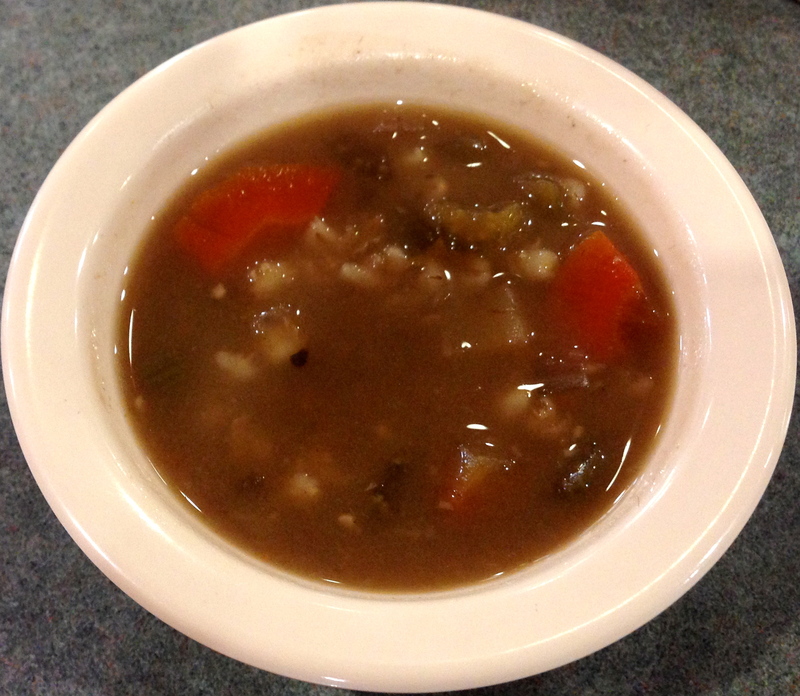 The chicken soup is wonderful on a cold winter’s day. What a fabulous recap – better than mine’ll be. The original Cheeseburger Bobby’s is in Hiram, however. The one in this center is the first one inside the perimeter, though! Thanks for pointing that out about Cheeseburger Bobby’s. I will update that in the entry!